Jason Tonioli started piano lessons when he was 5 and hated practicing most of the time he took lessons. His mother and teacher kept him going with the promise that when he composed his own music, he could play it any way he wanted. In addition to his own recordings, Tonioli has written music for a television documentary and many online video productions. 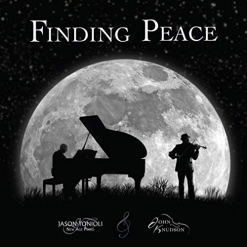 Finding Peace begins with “Prayer for Peace,” a sincere and heartfelt plea that sets the tranquil tone of the album. “Hope” was actually composed the morning of the recording session. After a few takes, the recording engineer suggested transposing the piece to a more “violin-friendly” key, and the piece then took flight. Although the tone is almost tragic, that glimmer of hope keeps it from despair. The tender “Lullaby for Linzie” is so comforting I almost want to curl up and take a nap! “Remembering” is wistful and nostalgic, looking back on a very happy memory. My favorite piece on the album is “Prayer for the Children.” A second violin represents those who help parents and teachers guide children to become the best they can be. “Sleepsong” and “Dreams” could easily serve as warm and soothing lullabies for kids of any age. “Thinking of You” is another favorite. Tonioli composed the original version back in high school, but was never completely satisfied with it. He and Knudson did some re-working for this album, and the results are gorgeous! “Guide Me to Thee” is a fully-orchestrated arrangement of a traditional hymn. “Forgiveness” and the title track are also favorites. Both are deeply emotional and really touch the heart. The closing track is an arrangement of Brahms’ Lullaby that features the vocals of CaraNua, an Irish/Celtic singing group. The instrumentation is very spare, allowing the angelic voice of Lynn Hilary to wrap the listener in velvety warmth. Finding Peace provides a wonderful musical escape from the craziness of life! I can’t wait to hear more from Jason Tonioli and John Knudson! The album is available from Amazon, iTunes, as well as various streaming sites.